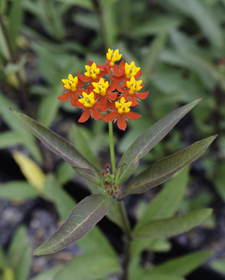 Joy Creek Photo Archive (c) all rights reserved If only this South American milkweed were reliably hardy in our gardens! The wonderful combination of flower, leaf and stem color makes it hard to resist growing this tender perennial. The red in the name refers to the richly colored rounded buds which appear in clusters of 10 to 20. When the buds open, they reveal flowers composed of five reflexed scarlet corollas that are crowned with a brilliant yellow corona. The lance-shaped leaves are matte green blushed with burgundy. They grow in pairs up dark stems. Late in the season, spindle-shaped seedpods develop bearing seeds with silvery, silky tufts. Summer. 3-4 ft. x 3-4 ft.